Photo courtesy of Stack’s Bowers Galleries. Hover to zoom. Santa Ana, California — Stack’s Bowers Galleries is thrilled to present the incredible 1879 Quintuple Stella from the Garrett Collection in their official auction of the Whitman Coins & Collectibles Baltimore Expo this March. 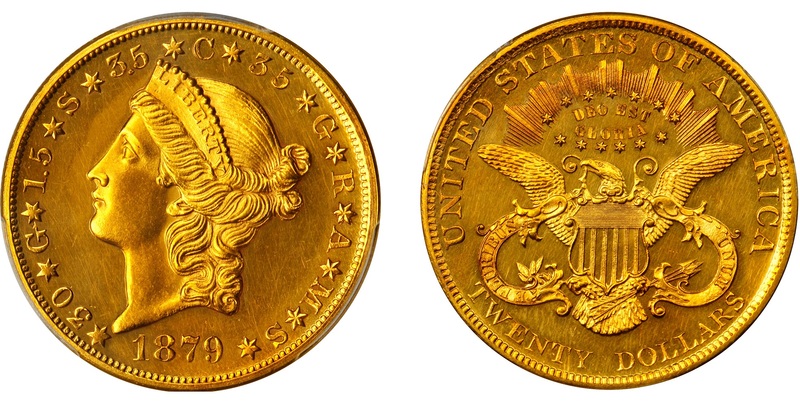 The 1879 Quintuple Stella is among the most legendary issues of United States numismatics, recognized for both its beauty and incredible rarity. It is the larger sibling to the more prolific Four-Dollar Stellas struck in 1879 and 1880 and shares with them a similar obverse legend outlining their proposed compositions in metric units. These issues were products of a global push to establish an international currency and stabilize the price of silver, which had been falling since the California Gold Rush that began in the late 1840s. Though the Mint issued several significant patterns in the 1870s and 1880s, none were ultimately approved for circulation and the idea of an international currency was abandoned by the United States. The Quintuple Stella is much rarer than the Four-Dollar Stella. Just five examples survive of this large $20 pattern, one of which is forever impounded in the Smithsonian Institution. The most recent example to sell was the Brand-Carter-Simpson Specimen that realized nearly $1.9 million in a May 2016 auction. The piece to be offered by Stack’s Bowers Galleries can be traced directly back to its origins at the U.S. Mint and has since passed through the hands of several significant numismatists, including J.W. Haseltine, Dr. Edward Maris, and, of course, the Garrett family. Stack’s Bowers Galleries first handled this incredible treasure nearly 40 years ago as part of Bowers and Ruddy’s sale of the magnificent Garrett Collection, which was sold on behalf of John’s Hopkins University. It is now certified Proof-63 Cameo and is certainly one of the most beautiful survivors of this rare gold pattern. Stack’s Bowers Galleries conducts live, internet, and specialized auctions of rare U.S., world coins, currency, and ancient coins, as well as direct sales through retail and wholesale channels. The company’s 80-year legacy includes the cataloging and sale of The D. Brent Pogue Collection, The John J. Ford, Jr. Collection, The Louis E. Eliasberg, Sr. Collection, The Harry W. Bass, Jr. Collection, The Norweb Collection, The Cardinal Collection and The Battle Born Collection — among others. World coin and currency collections include The Louis E. Eliasberg, Sr. Collection of World Gold Coins, The Kroisos Collection, The Alicia and Sidney Belzberg Collection, The Wa She Wong Collection, The Guia Collection, The Thos. H. Law Collection, and The Robert O. Ebert Collection. The company is headquartered in Santa Ana, California, with offices in New York, Wolfeboro, Hong Kong, and Paris. Stack’s Bowers Galleries is an Official Auctioneer for several important numismatic conventions including American Numismatic Association events, the New York International Numismatic Convention, the Whitman Coin & Collectibles Spring, Summer, and Winter expos, and its April and August Hong Kong auctions.